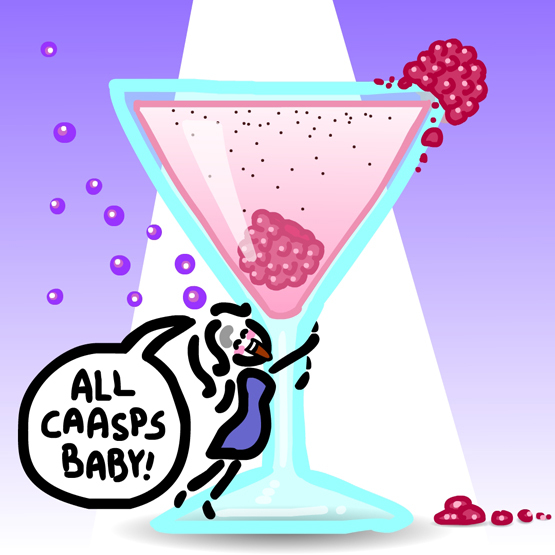 The Animated Woman: JC's ALL CAPS (a cocktail). I just now invented a cocktail. I really wanted a glass of wine, but there weren't none in the house. Faced with a gigantic pile of dishes and no dishwasher, my cocktail was born of necessity. I checked the pantry but all I could find was a cheap bottle of Sangria someone had left at one of our parties...and some scotch. BLEGH. I decided to raid the canned goods shelf; and lo, nestled between the Chinese rice wine vinegar and the coconut puree was a glass container of homemade raspberry liqueur, a gift from my Aunt back in 2007 (it has a label!). Beside it: Poire William. Mostly raspberry liqueur...say, 2 oz. Same for Poire William, 2 oz. One quick grind of pepper - don't put too much. Put it all into a shaker thingie. Shake it up. Pour through a strainer thingie into a really nice glass. Garnish with a couple of raspberries. Drinksies. YOU WILL BE ALL CAPS FOR ABOUT 20 MINUTES. If you don't have raspberry liqueur just use whatever. And if you don't have Poire William...go to the shops and buy a bottle of wine. Does it matter? LET THE ALL CAPS BEGIN! What is Poire William? We don't have that, that I know if, in Caleeforkneeuh. It's a French eau de vie distilled from Bartlett pears. Some bottles are sold with an actual whole pear grown inside it, called "Poire Prisonière" (imprisoned pear). Lord, woman! Do you realize what could have happened if there had been an electrical spark or someone lit a match in the vicinity? Goodbye house. You're right. Best to drink it quick.